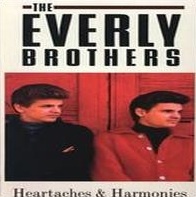 Heartaches and Harmonies is a compilation box-set CD by the rock and roll duo The Everly Brothers, released in 1994. It contains 103 songs spanning from a 1951 radio performance of "Don't Let Our Love Die" through 1990. It contains their early Cadence hits and a large representation of their Warner Bros. output. Alternate takes and less-successful singles are also included. This page was last edited on 18 October 2018, at 22:54 (UTC).